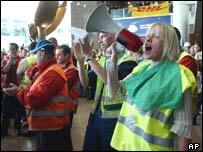 Courier firm DHL is ditching plans to site its international hub in Brussels at a likely cost of 1,700 jobs by 2008. Negotiations with local and federal authorities over increasing the number of night flights have failed, the firm told BBC News Online. Many of the firm's 3,000 staff at Zaventem airport walked out in protest when told the news on Wednesday night. DHL, an arm of German delivery group Deutsche Post, said it is instead looking at sites in France and Germany. Xavier de Buck, DHL's commercial director, told BBC News Online that the company had had a shortlist of three - Zaventem, Leipzig in eastern Germany and Vatry, 120km east of Paris. DHL, he said, had been negotiating the night flights issue with the Brussels and Belgian federal governments since January. "We were promised an answer by 1 September, and instead we got more and more restrictions," he said. "It became obvious that we did not have the consensus to push forward the project, and had to look for other alternatives." The government said that DHL had caused the breakdown of the talks by adding "additional conditions, additional planes, more flights". 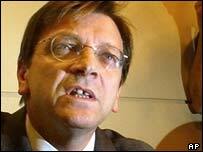 "Of course, they made it impossible," said prime minister Guy Verhofstadt. The firm is now planning talks with its partners about helping those who would lose their jobs, Mr de Buck said. The night flights issue has proved a controversial one in Belgium. DHL has insisted it needs to use bigger aircraft and increase night flights out of Zaventem if the airport is to be viable as an intercontinental hub. If it had got its way, the airport would have had 22,000 night flights a year - an increase of almost 70%. Federal and local authorities have been deadlocked over the issue. But now that DHL has made the decision to look elsewhere - demoting Zaventem to handling regional traffic for the Benelux countries, northern France and western Germany - politicians have voiced their dismay. "It's a social tragedy," Belgium's deputy prime minister, Laurette Onkelinx, told RTBF radio.